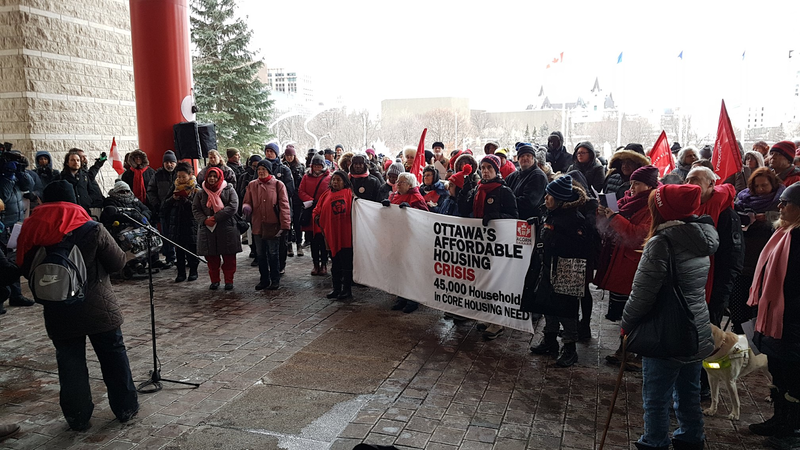 Close to 200 at Ottawa Rally for Affordable Housing- Win $15 Million in City Budget! CLICK HERE to send an email to the Mayor and your city councillor, thanking them and urging them to vote for the budget in March. On Wed, Feb 6th just one hour before City Council met to discuss the draft budget for 2019, ACORN members and our allies led a citywide rally outside City Hall, calling for more funding for affordable housing. Close to 200 ACORN members and our partners attended to support our campaign demanding the City invest $12 million of its own funding to build new affordable housing. Creating a 2019-2022 Term of Council Priority that integrates transit and planning, with clear, affordable housing targets. At our rally, we had ACORN members share their stories of struggling to afford rent or find affordable housing for their families as well as guest speakers like Councillor McKenney and Fleury who were joined on stage by Councillors Kavanagh, Leiper and Menard. The rally concluded with an affordable housing song from Making Voices Count/CAWI before all of us marched into City Council Chambers to learn what was in the draft budget! And guess what we heard… The Mayor announced that the City would be committing 15 MILLION DOLLARS of its own resources to create new affordable housing! The is a massive victory for our members who have been working tirelessly for over a decade for more affordable housing in our city. A $15 million investment in affordable housing will more than DOUBLE the affordable housing units currently being built by the City each year. But the fight is not over! Changes to the budget can still be made before it is voted on at the City Council meeting on March 6th. So help us keep up the pressure by calling/emailing the Mayor and your City Councillor today, asking them to support the $15 million currently in the budget for affordable housing! CLICK HERE to send an email to the Mayor and your city councillor. Thank you to our allies who co-organized the rally and are part of the campaign for affordable housing near rapid transit: The Alliance to End Homelessness Ottawa, City for All Women Initiative (CAWI), Centretown Citizens Ottawa Corporation (CCOC), Healthy Transportation Coalition, the Coalition of Community Health and Resource Centres (CCHRC), Ottawa District Labour Council (ODLC) and Making Voices Count (MVC) as well as the other 60+ organizations who have endorsed the campaign.